The Bretons inhabit the province of High Rock. High Rock borders Hammerfell across the Bangkorai Pass to the southeast and Skyrim across the Druadach Mountains to the east. Its landscape is diverse, ranging from green forests through badlands to snowy mountains. 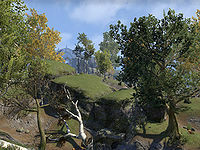 High Rock consists of five main regions: Glenumbra, Stormhaven, Rivenspire, northern Bangkorai and Wrothgar. In addition, the islands of Balfiera and Betony are also a part of High Rock. Glenumbra is the westernmost region of High Rock, encompassing most of the large peninsula separating the Iliac Bay from the Eltheric Ocean. It borders Stormhaven to the northeast and Rivenspire across the King's Guard Mountains to the north. The region contains the city-states of Daggerfall and Camlorn and the great cemetery of Cath Bedraud. The ancient battlefield of Glenumbra Moors, where the Direnni defeated the Alessian Horde, is also located here. The southern forests of Glenumbra are home to several witch covens, like the Beldama Wyrd and the Glenmoril Wyrd. The region consists mostly of rolling green hills and forests; there is also a sizable swamp around the area af Hag Fen, to the southeast of Camlorn. Stormhaven is the central region of High Rock, situated at the mouth of the Bjoulsae River. It borders Glenumbra to the west, Rivenspire to the northwest, Wrothgar to the north and Bangkorai to the east. 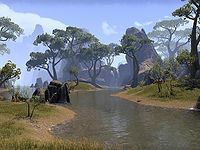 Stormhaven is home to the great trading city of Wayrest, and also to the region of Alcaire, the celebrated birthplace of Tiber Septim. The region consists of sparsely forested green hills. Rivenspire is the northern area of High Rock. It borders Glenumbra across the King's Guard Mountains to the southwest, Stormhaven to the south and Wrothgar to the southeast. The region contains the city-states of Shornhelm and Northpoint and the infamous Crypt of Hearts. It also contained the Doomcrag, a massive Ayleid tower, before it was destroyed in 2E 582. The region's landscape is rather gloomy and consists of dry badlands, with jagged rock formations, flinty crags, windswept moors, and narrow canyons. The two regions of northern Bangkorai, Mournoth and Ephesus, make up the southeastern reaches of High Rock. The region borders Wrothgar to the north, the Reach in Skyrim and Craglorn in Hammerfell to the east, and the Fallen Wastes of Hammerfell, which make up the southern Bangkorai, to the south. The main settlement is the city of Evermore. 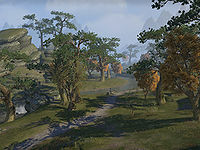 The region is home to the Bangkorai Pass, a fortified garrison which serves as High Rock's protection against the raiders from Hammerfell. 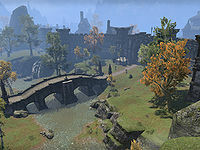 Another notable location is the Halcyon Lake, where the ruins of Bisnensel, a city founded by the last Ayleid king Laloriaran Dynar, are located. The region consists of forested uplands. Wrothgar is the northeastern region of High Rock. It borders Rivenspire to the west, Stormhaven to the south, the Skyrim holds Haafingar and the Reach to the east and Bangkorai to the southeast. The region is home to the great Orcish city of Orsinium, located in the Wrothgarian Mountains, as well as the Breton city-states of Farrun and Jehanna. It also contains numerous Orc strongholds and Dwemer ruins. The great mountain of Sorrow can be found in the extreme northeast, on the border with Haafingar. The region's climate is harsh; the landscape consists of boreal forests, tundras and snowy mountains. The isle of Balfiera is situated in the middle of the Iliac Bay. 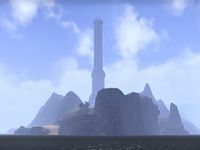 It is renowned as the site of the Direnni Tower, also known as Adamantine Tower, which is the oldest known building in Tamriel. The green and forested isle of Betony is situated to the south of Glenumbra. In the Second Era the island was conquered by the Stonetooth Orcs, who renamed it Betnikh. Eventually the island was reclaimed by the Bretons. The island is well known for triggering the War of Betony in 3E 403. It can be rightly said that history begins in High Rock. Convention occurred here, at Adamantine Tower, the oldest structure in existence. The tower was there when Aldmer settled the region and inspired almost every race of mer to create a mimicry of it. Like other provinces, it is believed High Rock was originally inhabited by beasts, but the Aldmer were the first to develop civilization. The Nedes who later settled the region were mostly absorbed by the Aldmer, but eventually a biracial man-mer society arose, and the ancestors of the modern Bretons were born. With the arrival of the Nords (and yet another bloodline), the fall of the Direnni Aldmer of the region was assured. The humans would eventually become the predominant power in High Rock. 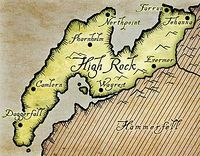 The most concrete history of High Rock begins with its most well known colonized family; the Aldmer Direnni Clan. 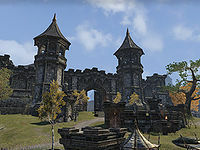 Described by A Pocket Guide to the Empire "As an economic and military power, they were formidable enough to pose a threat to the battle-hardened Nords and the nascent Alessian Empire of Cyrodiil. Taking advantage of the internal strife in Skyrim, the Hegemony began taking land north and south of High Rock, claiming portions of Skyrim and present day Hammerfell. At the peak of their power, they controlled nearly a quarter of Tamriel. But they had overextended their reach, and slowly, year by year, they lost all that they had gained, falling back to their fortress in Balfiera, The Adamantine Tower, now called the Direnni Tower." It is believed the Bretons came to power in High Rock not by violence, but by trading and slowly overcoming the Nordic population. The province of High Rock was controlled by the Bretons by the end of the First Era. The Direnni made an impact on the Breton population, as they left the province split apart into numerous city-states. They would not be given peace, however, as the Redguard conquest in 1E 808 caused conflict in settlements along the Iliac Bay. They would have to unite, however, against the Orcs of Orsinium. This battle is known as the Siege of Orsinium, and ends with the destruction of Orsinium. In 1E 1029, Empress Hestra of the Alessian Empire routed King Styriche, the Vampire of Verkarth, and drove his host westwards into the Bangkorai Garrison. The Garrison held, and Styriche was crushed between the two forces. Impressed with the Bretons, Hestra granted High Rock admission into the Empire soon thereafter. However, the Garrison would later also play a role in High Rock's departure from the crumbling Empire in 1E 2305. Attempting to bring it back into the fold, the Legions of Piety and Grace laid siege for five months, but were ultimately unable to break the Garrison and retreated in disgrace. In 2E 542, the Reachmen under Durcorach the Black Drake invaded High Rock, sacking Evermore and Camlorn. 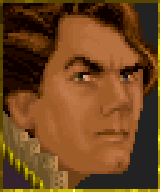 They were defeated at the gates of Daggerfall by Emeric of Cumberland, which led to the formation of the first Daggerfall Covenant, signed by the kings of Daggerfall, Camlorn, Shornhelm, Wayrest and Evermore. In 2E 563 Emeric became the king of Wayrest. Three years later, king Ranser of Shornhelm invaded Wayrest, angry at Emeric for rejecting his daughter's hand. He was defeated at Markwasten Moor by the forces of the Covenant. These events led to the formation of the Greater Daggerfall Covenant, which was an alliance between Emeric, the Redguard king Fahara'jad and the Orcish king Kurog gro-Orsinium. The Covenant later participated in the Alliance War. High Rock was eventually brought into the Third Empire by Tiber Septim during the Tiber Wars. Still divided, some did unite to try to stop the Camoran Usurper, yet he was not stopped until the Baron of Dwynnen united the citizens of the Iliac Bay against him. The Bretons would not remain united, and went back to fighting one another, and those outside of High Rock, until they had to unite when the Nords reclaimed their land in the War of Bend'r-Mahk, when they fought the Redguards in the War of Betony, and when the Orcs resurrected Orsinium. However they would be united in The Miracle of Peace, also known as the Warp in the West, which is best described in the book of the same name. 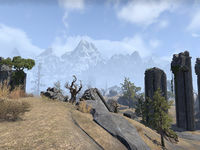 "The 'Miracle of Peace' is celebrated as the product of the miraculous interventions of Stendarr, Mara, and Akatosh to transform this troublesome region into peaceful, well-governed Imperial counties. The catastrophic destruction of landscape and property and the large loss of life attending upon this miracle is understood to have been 'tragic, and beyond mortal comprehension.'" This event transformed High Rock from numerous city-states into five kingdoms. Relations have not been entirely peaceful between the five Breton kingdoms, but they have not gone into full war. Some kingdoms may unite however, by the marriage of Camaron of Sentinel to Lady Kelmena of Camlorn, and also by the marriage of Queen Aubk-i of Sentinel to King Gothryd of Daggerfall around 3E 400. Things have been quiet in the areas of Northpoint and Evermore, most likely because they are mostly isolated from the other states. 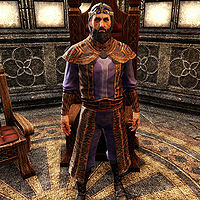 In Wayrest, Queen Elysana is considered one of the province's most powerful figures, and is in control of its politics. She has also formed an alliance with Gortwog of the Orcs (her former enemy), as described in the history section of this page. Most of the cities in High Rock are built in the Breton style, with houses built primarily from stone, strong walls and high towers with the spires. Orcish architecture can be found in Wrothgar. Additionally, a number of Ayleid and Dwemer ruins can be found in High Rock. 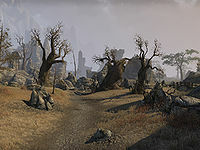 Glenumbra, Stormhaven and northern Bangkorai have a relatively mild climate and are covered in temperate forests, whereas the dry region of Rivenspire contains mainly crooked trees and faded grass. Many various creatures inhabit High Rock, among them wolves, bears, nereids, harpies, crocodiles and spriggans. In Wrothgar, echateres, riekr, and even horkers can be found. Located on Balfiera Island, this spire is the oldest structure in existence. The estimate of the date of its construction marks the beginning of history. A large defensive fortification on the border with Hammerfell. A large cemetery in northern Glenumbra. The main city of the state of High Rock of the same name, located in northern Glenumbra. An infamous dungeon located in southeastern Rivenspire. The main city of the state of High Rock of the same name, located in southern Glenumbra, south of Camlorn. 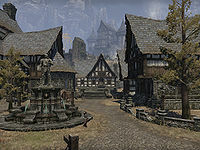 The main city of the state of High Rock, Evermore, located in northern Bangkorai, near the eastern border to Hammerfell. A city on the north shore of High Rock. A site of the ancient battle between the Direnni and the Alessian Horde. A city in the northern area of High Rock, near the border to Skyrim. The main city of the state of High Rock of the same name, in northern Rivenspire. The newly autonomous province of Orcs, led by Gortwog. A city in central Rivenspire. An ancient Ayleid tower, destroyed in 2E 582. The main city of the state of High Rock of the same name. It is located in southern Stormhaven. For game-specific information see the Daggerfall and Shadowkey articles. This page was last modified on 11 December 2018, at 02:16.